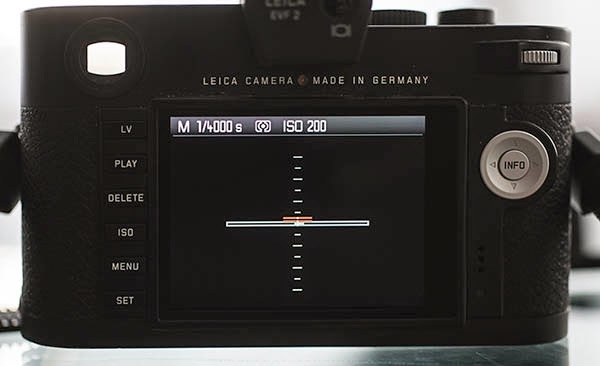 Leica's recent firmware update 2.0.1.5 for the Leica M (240) contains improvements that add some convenient features to augment the shooting experience. Below are some of the features I find particularly helpful. The "Exposure Simulation" feature is quite handy if you are shooting manually and want to see how the image will look under specific settings. Sometime, for instance, you might want to intentionally under-expose a photo to emphasize the highlights and down-play the shadows. You now have two choices under "Exposure simulation". The "Permanent:" setting shows you the actual results of your chosen exposure, while the "Release button half-pressed" allows you to preview with a brighter image to aid focusing but then see what the actual exposure simulation when the shutter button is pressed half way. Cropping guidelines for 3:4 / 6:7 / 1:1 / and 16:9 aspect ratios can now be displayed in live view. I tend to use 1:1 quite a bit particularly for my art images, and also the 16:9 format for more of a panoramic look. So for me this feature is quite handy. This feature is one of the reasons I like the Fuji X-series cameras so much. Unfortunately, the crop lines are only displayed on the Leica so the crop is not actually transmitted to the final image as it is on the Fuji. On the Fuji X-T1 or X-E2, for instance, you can shoot in RAW + JPEG and your jpg images will receive the crop while your RAW files will display the crop but also remain changeable later in post-processing. I find this to be an incredibly convenient feature for the type of shooting I do. Nonetheless, I should be thankful for small favors and at least adding the crop lines to the Leica live view image is a vast improvement over no crop lines at all. A Horizon level has been added to live view and can be turned on or off on the from the menu. It can them be conveniently displayed by cycling through the options of the "Info" button. Focus peaking colors now come in red, blue, and green -- a somewhat handy feature when you are working under circumstances with a predominant color and need a contrasting color to make the focus peaking easier to see. For those of us who keep turning on the video recording by accidentally hitting its M activation button near the shutter release, the video recording button can now be turned off with the "Set Menu". 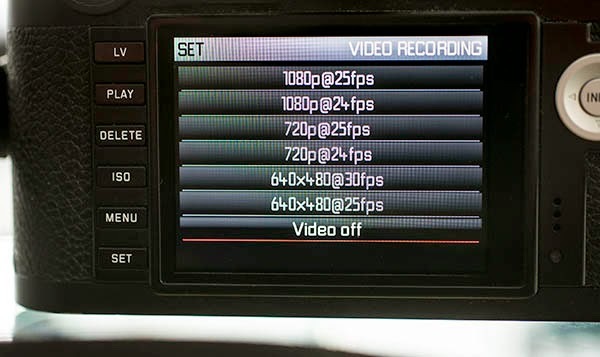 Note also that a 25fps mode has been added to compensate for flicker with 50Hz voltage. 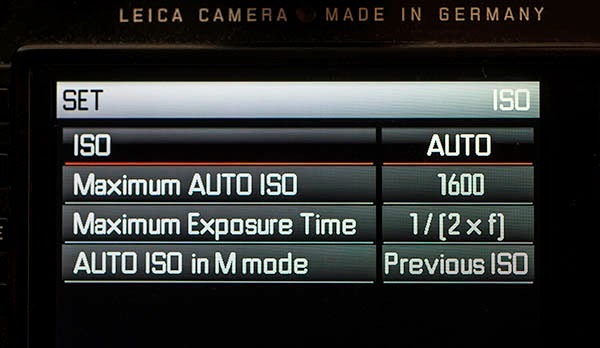 The auto-ISO feature now extends to Manual mode shooting and has added 1/4 and 1/2 x to 1x focal length as options making a far better feature for hand-held shooting than it had been. Now with a shorter lens like a 35mm you can work automatically at a faster 1/60 or 1/125 second instead of the slower 1/30th. Unfortunately for me, I did not have a good enough internet connection on my recent trip to allow me to download the file when it first became available. I would really have appreciated having some of these updated features. Ah well, suppose I'll have to plan another trip soon just to take advantage of them. 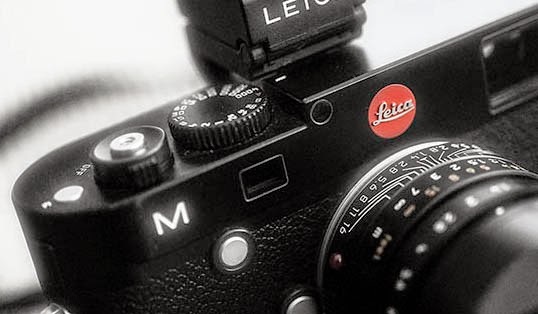 Firmware update 2.0.1.5 for the Leica M (240) can be downloaded here.